The infamous 1987 live broadcast! The guys and gals behind WNUF Halloween Special have taken this whole found footage thing to its literal, logical extreme. 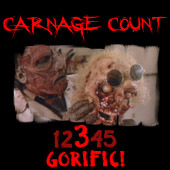 Upon completion, the film was randomly dropped in conspicuous locations (like convention floors) to be found by unsuspecting bystanders who believed they had stumbled upon a long-lost dispatch from 1987. In the tradition of The Blair Witch Project, this is a film whose reputation preceded its arrival thanks to its blurring of fiction and reality. In recent years, found footage has become more of an aesthetic, but WNUF Halloween Special is committed to the gimmick in a way many films simply aren’t: there’s not even a pretense that this is a film—it’s more like an experience to be passed around in the same way bootleg VHS copies once were. Providing only the barest of contexts, it opens with the sound of a tape loading into a VHS deck, the film--for all intents and purposes—looks, sounds, and feels like a recording of a nightly news program recently fished from a box of ancient, forgotten tapes. 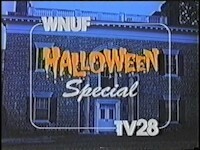 For about twenty minutes, viewers are treated to a Halloween night newscast and its surrounding detritus, including advertisements for local establishments and upcoming programming. As the broadcast wears on with Halloween-themed segments, the thrust of the film’s story emerges: following the news, the station will air the WNUF Halloween Special, where reporter Frank Stewart (Paul Fahrenkopf) will investigate the supposedly haunted Webber House. The site of a gruesome murder in 1968, the home has been unoccupied for nearly twenty years—until this fateful night, of course. A natural convergence of recent horror preoccupations, particularly nostalgia and the found footage approach, WNUF Halloween Special is the cinematic equivalent of mainlining the past, its actual story somehow managing to take a backseat to its window dressing. Typically a recipe for disaster, the tactic works here because director Chris LaMartina (and over a half-dozen accomplices behind the camera) perhaps senses that the story itself is so rote that it requires diverting embellishments in the form of the surrounding experience. The answer is to craft the public access answer to Grindhouse by presenting not only a movie but also a nostalgia trip to act as icing on top of the cake. While Tarantino and Rodriguez’s individual confections are more sumptuous than the somewhat stale treat on display here, the added tricks certainly work. For as ramshackle as the film’s haunted house foundation is, everything built upon it is impeccably crafted. LaMartina’s dedication to reconstructing 1987 local news broadcasts could easily dupe unsuspecting viewers into mistaking this as the genuine item. Between its form (the movie was shot on vintage cameras and then degraded three times over) and its content (both the actual broadcasts and the commercials capture that homespun, regional flavor), WNUF Halloween Special is an utterly convincing recreation. Anyone familiar with the era will immediately recognize its low-grade production values and chintzy charms; those unfamiliar will be transported to a gilded age where pizza joints featured arcades and computers were a downright alien technology to be mastered at local businesses specializing in peddling them to the masses. Unexpectedly, the various commercials emerge as the film’s key element. I almost can’t believe how perfectly the film recaptures the spirit of these ads, from the overly enthused voice-overs to the small town sense of direction (an ad for one joint fixes its location “just past the bowling alley,” for example). The sheer variety on display is also impressive: everything from mudslinging campaign ads to strip clubs to money-grubbing infomercials flicker beneath the haze of the over-the-air aesthetic. The news broadcast itself isn’t to be underestimated, though. Leanna Chamish and Richard Cutting serve as the dopey anchors, there to dish out both the news and awful jokes in equal measure. Even the general tone-deafness of local news shows is recreated: one minute, these two are sending viewers out to a fluff piece about dentistry during Halloween season, the next they’re solemnly relating the story of a child that was murdered while trick-or-treating a year earlier. These deadpanned transitions are treated perfectly obliviously, which is, of course, the key to lovingly re-crafting a bygone age or style: one can’t feel as though they’re completely above it and compelled to laugh at its obvious awfulness. You find yourself laughing at WNUF Halloween Special for the exact same reasons you’d laugh at the actual local news even today (if my local stations are any indication, this awfulness transcends time): the goofball personalities (the meteorologist here is just a “weatherman” in every respect, more a clown with a weather map than anything resembling a professional), the cringe-inducing pun-filled dialogue, the absolute fluffiness of many of the “stories” on display. That the actual story feels like an afterthought feels like it should be more disconcerting, but it’s actually not that threadbare—it’s merely outshined by everything around it. Of course, given the preponderance of similar films, one can hardly blame LaMartina and company for giving such familiarity a new package, which is the least one can ask for at this point. It’s not the familiarity of this genre that’s grown tiresome—it’s the uninspired presentation. WNUF Halloween Special is anything but uninspired, with even its standard haunted house fare managing to have its moments. Fahrenkopf is great as the obliviously cornball host, who is something of a poor man’s Geraldo Rivera. Instead of raiding Al Capone’s vaults, here is forced to chum it up with clueless locals and pranksters, not to mention a couple of completely serious paranormal investigators (a husband, wife, and cat trio in the order of the Warrens). It does take a while for the proceedings to escalate, and LaMartina’s commitment to absolute realism deflates the tension down the stretch, as the special goes to commercial break an absurd number of times (so much so that you’ll likely be sick of hearing the stock sound effects during the bumpers.). Fortunately, it does at least stick the landing: rather than opt for the standard ambiguous ending, WNUF Halloween Special offers enough information to set up its final punchlines, as both the culprits of the haunting and the out-of-touch news crew become satirical targets. WNUF Halloween Special is an intriguing case of nostalgia muddying the waters; certainly, much of its effectiveness owes to its evoking the past, leaving one to wonder what it might have to offer to anyone unfazed by such an endeavor. Clearly, this is a handcrafted love letter for those weaned on its specific flavors. Is it enough for a film to essentially hold a viewer’s hand and lead them down memory lane? Probably not, but I can’t deny this particular instance is quite a trip and definitely confirms that the found footage well hasn’t run completely dry just yet. If you were not lucky enough to stumble across it in the wild, rest assured: thank to Camp Motion Pictures, WNUF Halloween Special is available on DVD. “Compiled from the highest-quality source material available” (kudos to Camp for respecting the gimmick), the disc features both the full “lost” program and a wealth of supplements, including a commentary, bloopers & outtakes, a bit that shows how the video was aged, a supplement that shows the footage that’s “fast-forwarded” through during the film itself (the VHS equivalent of Grindhouse’s “missing reel” gag, I guess), a trailer, plus two 30-minute retro-styled short films, both of which will pull you even further back into 1987 and a time when video store shelves were stocked by regional, homemade movies. It’s fitting that WNUF Halloween Special could have easily sat there at the time as well, right alongside the likes of Video Violence (and its sequel, to which this film feels like a kindred spirit). Time will tell if it holds up as more than an interesting curiosity, but, for now, I’m inclined to think it’s secured a spot in my October rotation for years to come. Buy it!